Although he already had academic experience in workshop, a working couple pursuing specific purposes within a macro project as is Dreamhamar is undoubtedly of great personal and professional enrichment. In these times of great changes in the balloon, it is vital to play all possible perspectives in what respects the materialization of public spaces, especially the invaluable contribution referred to the citizen who often is please ignore the territorial decisions and who has to endure to live in spaces that do not match their desire for expression and identity. Also exchange views with a team of both participants. Workshop as Ecosistema Urbano team has been extraordinary and I could feel a great energy of change and creativity in the different sessions in which they exchanged ideas beyond the architectural design discuss the role of participation and professional perspective in reference to public policies motivates me to keep this line participatory work in urban planning, even more when I find myself embarking on a new professional challenge in my country referred to these issues. About Methodology; it has followed a pattern of cool open discussion which has given the impression to be talking among professionals without the feature to receive a stiff chair of undergraduate or graduate studies, issues have been clearly blog post suggested by the open lectures or force you (in my case) to prepare comments and concerns previously or were emerging in the same measure in each session to discuss proposed design, type of public spaces and mechanisms for citizen participation. To figure online, consider was well (except sometimes the internet or something in the computer fails for some of the participants) because it allowed me to learn more about tools like Google hangout and giving a link livestream directly with anyone who wanted to participate through their chat. The computing resource was undoubtedly the fundamental tool to the success of the workshop as well as the continuous updating of web portal dreamhamar.org, the main source of information for who participated in the workshops. The city of Hamar is clearly divided in three parts according to the Booklet, which discriminated from south to north: Shore area, Centre area, and Housing area. It seems that the relationship of these bands is limited exclusively to the interaction of streets and avenues and not too hard, and those empty spaces found in its network, are not seen as meeting spaces, leisure or transit or simply do not provide any interest. 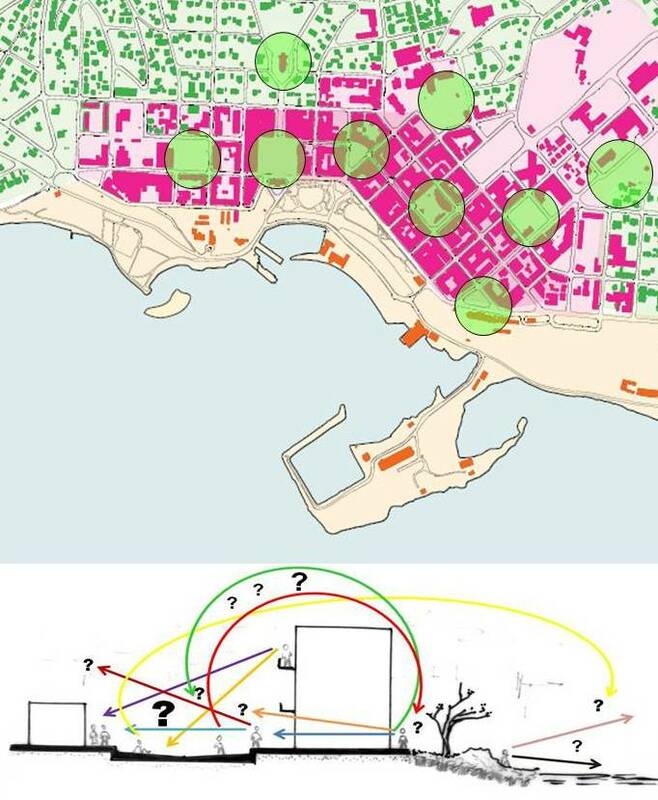 I believe that to facilitate such a meeting between citizens living in the three bands should be considered the idea of ​​working in public spaces neighbors with which it can generate a network that can generate routes between spaces, especially those to be placed in a transitional area between stripes. 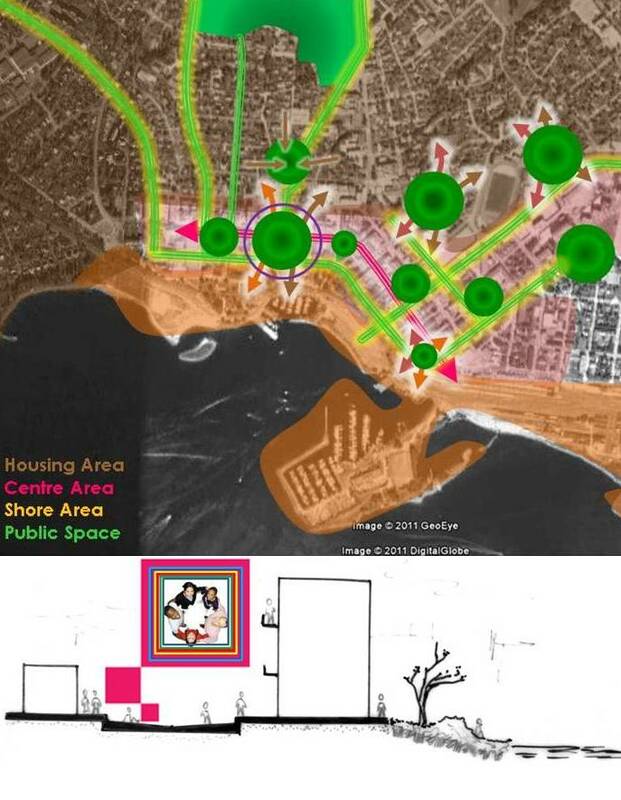 How to achieve?, Display inge very public space environments, identify their potential and that in turn can meet them through an effective physical connection by public transport optimization adequate sidewalks and bike paths. I propose consolidating the street Torggata as a cornerstone of the structure of public spaces within the facility where you can extend your extension to consolidate pedestrians thus establishing closer link between the east and west of the city. Reflecting on the spatial relationships of Stortoget, I saw this large block will tend to concentrate many activities because of its centrality and the influences it receives and will receive especially if you are so close to Mjosa lake. Taking into account the ideas that have Stortorget future especially in its relationship with the Storhamargata street which aims to provide a shared use, I propose to visualize Stortorget not a closed box where you can take ownership of the triangle-shaped space invested in which the Baath Building is located, in order to facilitate access to the coast of Mjøs. 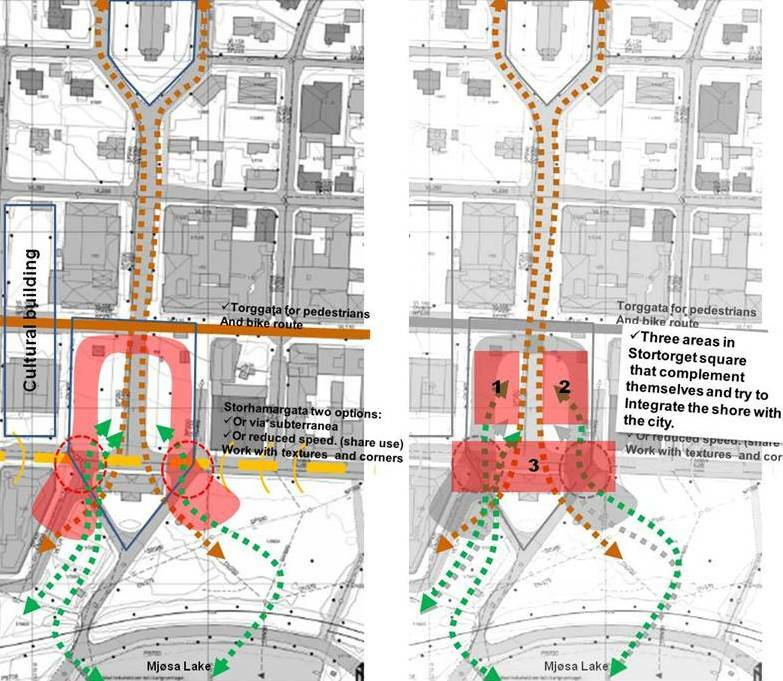 This link or contact could be in two ways: the first taking place all over the triangle fully linked, burying part of the Storhamargata street for vehicle use, the proposal may be a bit expensive and also depend on the water table present in the ground for such work. The second is to create a special area on the street Storhamargata street reduced speed, giving priority to pedestrians and cyclists, who can freely connect to the park bordering the Mjosa lake. All the experience I have had particularly in recent months has taught me that it is very important to listen more, is to understand realities and then capture the true essence of needs. The fact that a community comes together to discuss their problems is a great way for it to understand that only they can make a difference. The entire staff of professionals surrounding the project are just companions and facilitators of all this, why I believe strongly supports the idea that these projects out of the closed offices (which commonly happens) and look for the true raw materials are citizens who no doubt contribute to our evolutionary creativity (I speak of architects, designers and engineers). Since there is good evidence of products paces broad citizen participation and fills me with hope and satisfaction that this tendency is reinforced worldwide. I thank all who gave me the opportunity to participate and be a dreamer more. I have a commitment to continue the process with that “Dreamhamar” continue arousing public awareness and become reality!